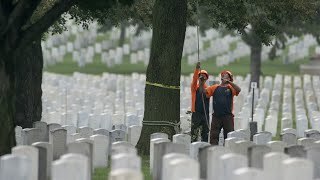 Created by Rainbow Treecare in 2015, Saluting Branches is now a non-profit organization dedicated to providing tree care services to honor our veterans and keep their cemeteries safe, beautiful places for all those who visit. This year over 2,800 volunteers participated at 53 national cemeteries across the US. This resulted in over $2.8 million worth of services for our nation's heroes! The 4th Annual Saluting Branches was held on Wed, Sept. 19, 2018.